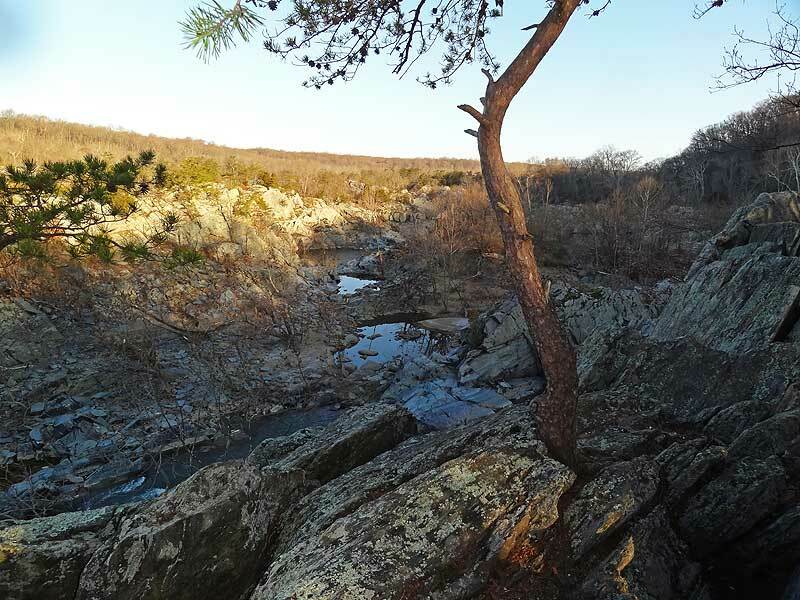 The Billy Goat Trail is very busy on nice days anytime of the year, however if you get on the trail by 8:00 a.m. you can miss all the crowds. 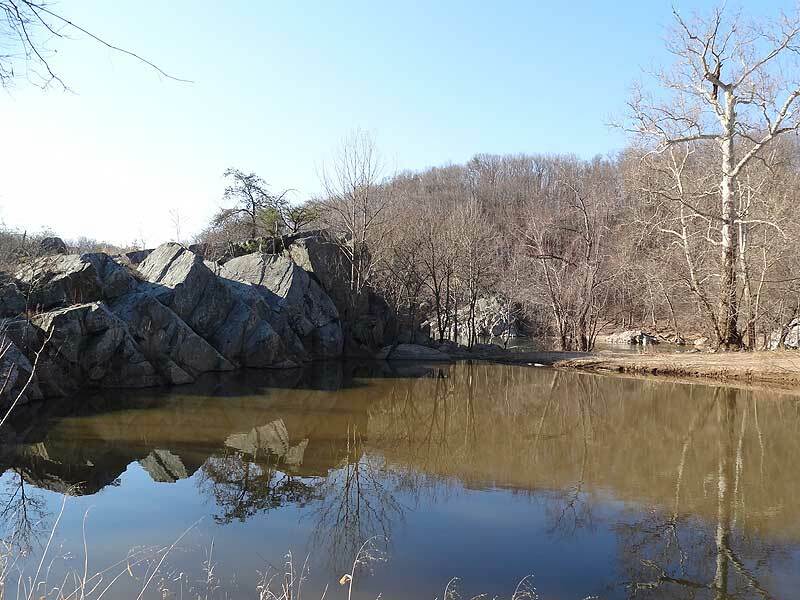 The entire Billy Goat Trail is made up of 3 separate sections A, B, & C, that start and finish on the C&O Canal. 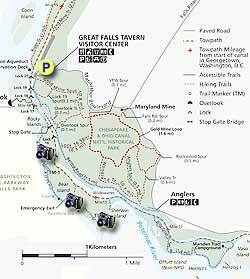 The 7.8 mile circuit we have mapped here follows the rock-hopping section A, the more casual hike on section B, with a return back to the Great Falls parking area using the Berma Rd. Trail and Overlook Trail. 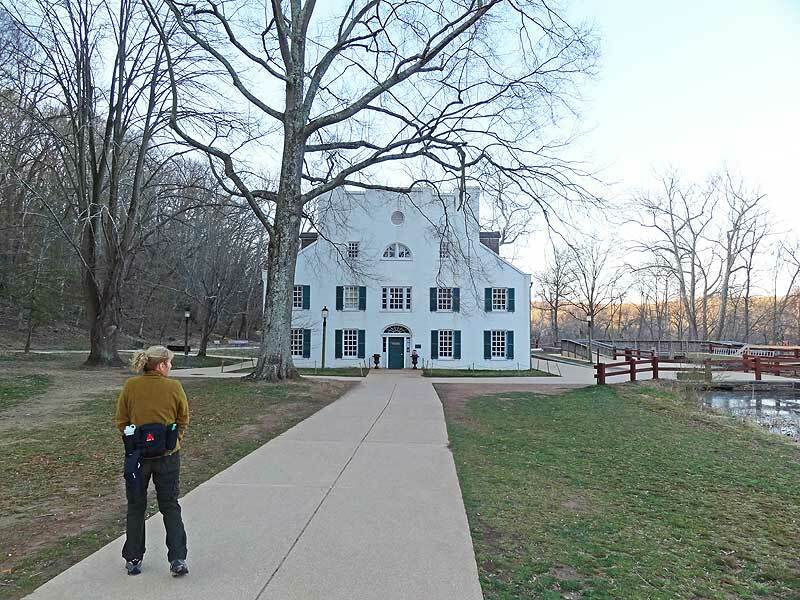 Mile 0.0 – From the parking area at Great Falls Park follow the path past the Great Falls Tavern and Visitors Center, cross over to the C&O Canal at Lock 19, then follow the C&O canal down to the entrance for the Billy Goat A Trail 50 yards before the covered Stop Gate. 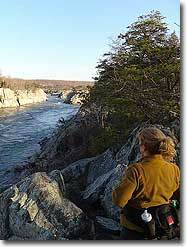 Mile 0.9 - Turn right onto the Billy Goat A Trail where shortly it starts paralleling the Potomac River. 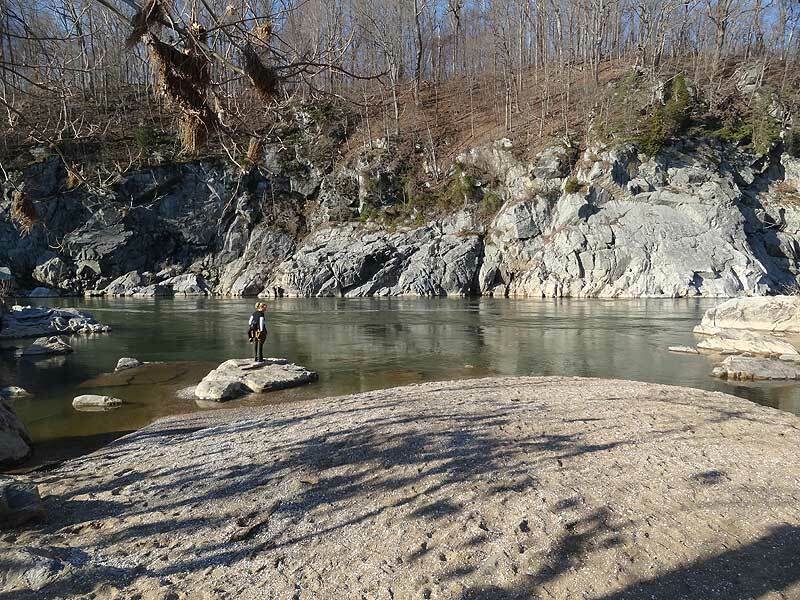 The Potomac River is approximately 50ft below at this point. 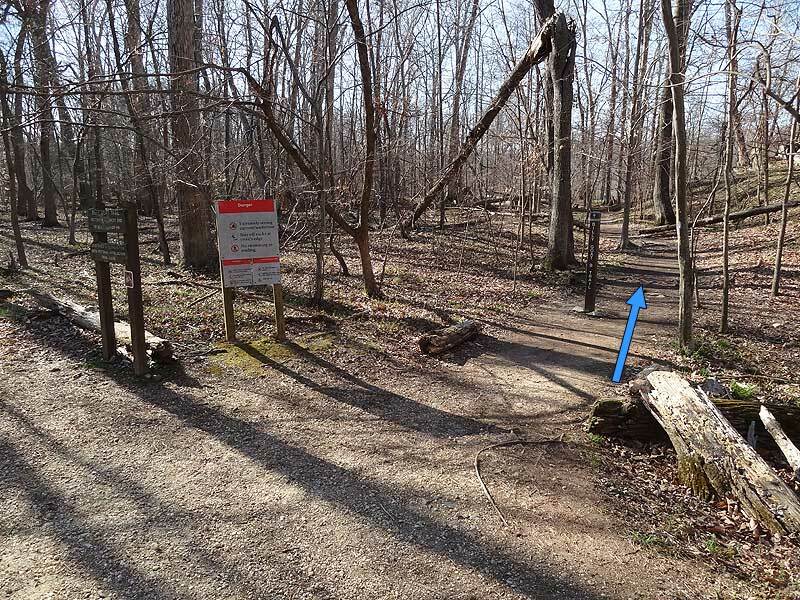 From here the trail becomes more of a rock-hop then arrives at Trail Marker 1. Mile 1.4 - Trail Marker 1 is the point where the rock-hopping becomes more intense. 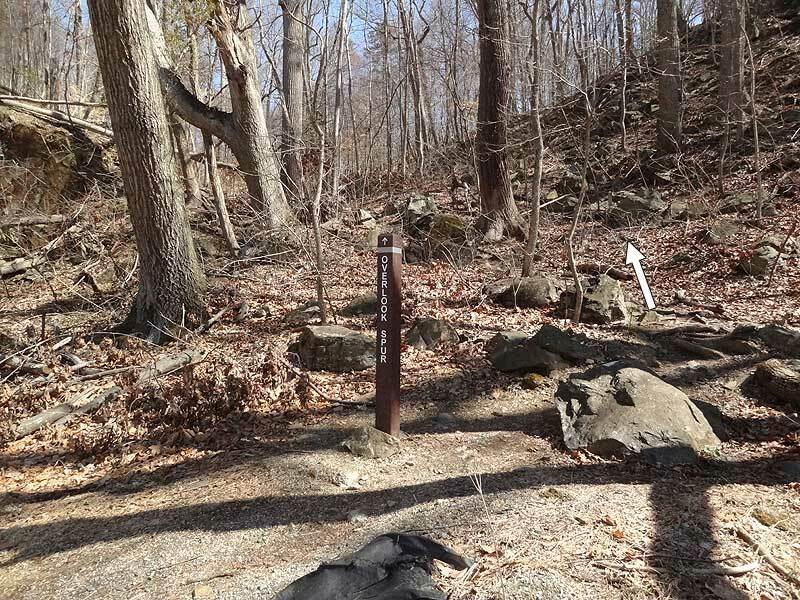 There is a National Park sign warning hikers that 'Many hikers are injured every year on this section of the Billy Goat A Trail' so be prepared for a little more scrabbling. 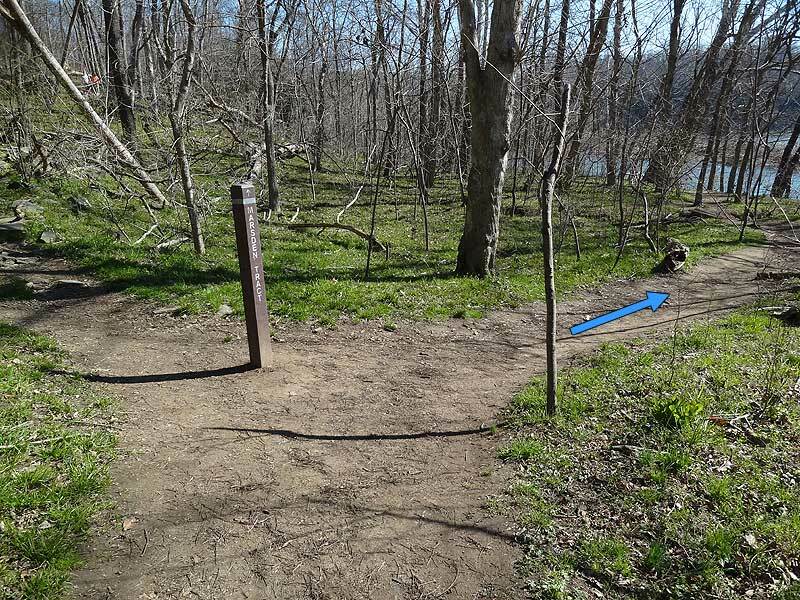 Between Markers 1 and 2 you also need to climb the 50ft traverse mentioned on the Trail Marker 1 sign. 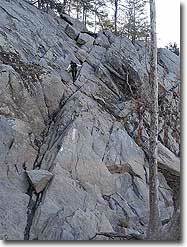 Although this might look slightly intimidating to some people, once on the traverse it's not that difficult. Mile 1.9 - From Trail Marker 2 the scrambling diminishes, and the trail descends to the river bank where there is a nice beach area. DO NOT be tempted to wade into the water as the currents are deceptively strong, and you can be quickly washed down stream. 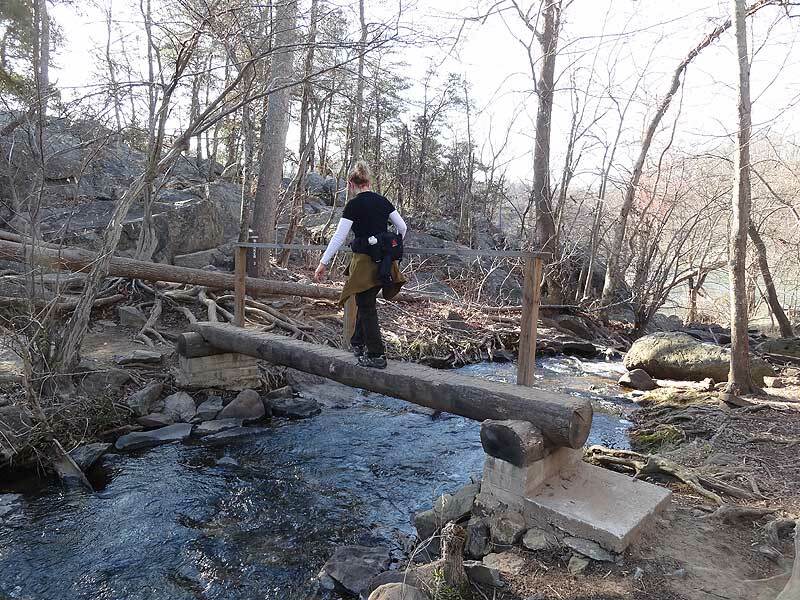 Continue along the trail passing a wetland, small pond, then crossing a small log bridge. 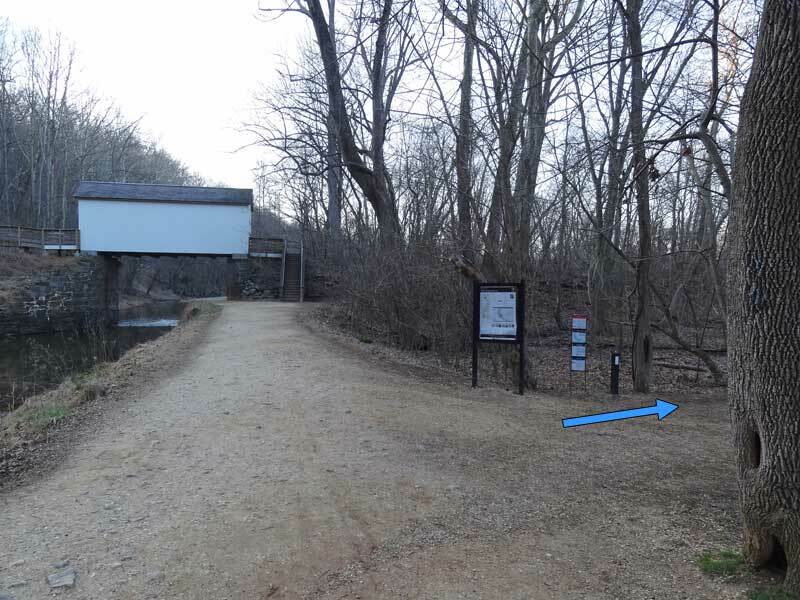 On the opposite side of the log bridge is Trail Marker 3. 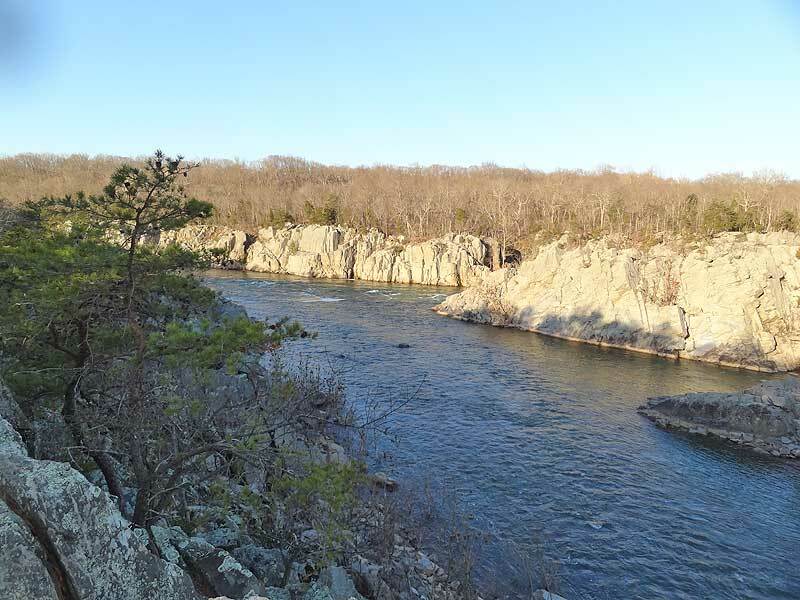 Mile 2.2 - From Trail Marker 3 there is one more spectacular panorama of the Potomac River before the trail becomes more gentle passing by Sherwin Island and arriving back at the C&O Canal. 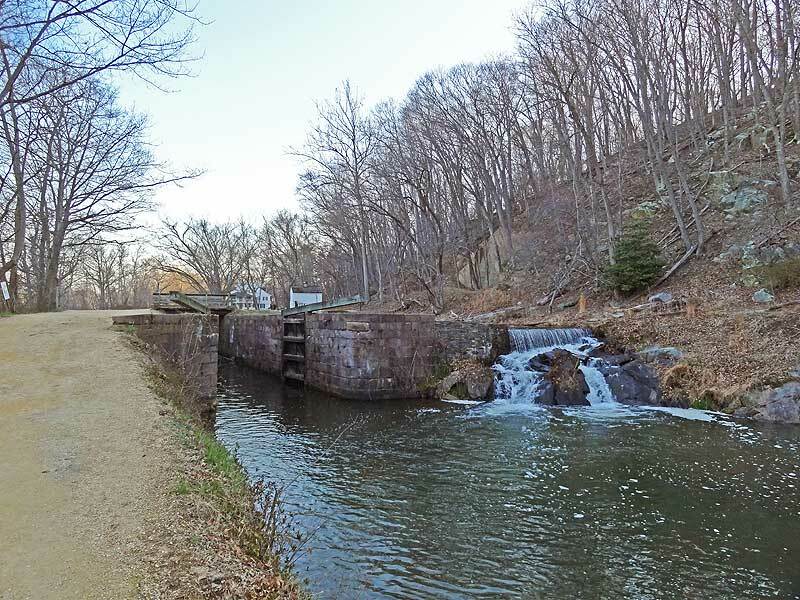 Mile 2.5 - Turn right on the C&O Canal following it for 0.6 miles to the entrance of the Billy Goat B Trail. Mile 2.8 - Turn right on the Billy Boat B Trail. The trail is considerably more leisurely than the Billy Goat A Trail, with only a small section of rock-hopping where the trail passes Hermit Island. 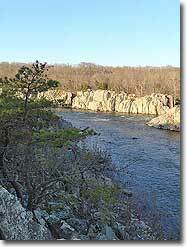 Where the Potomac River passes Hermit Island is a favorite spot for Paddle Boarders surfing the river wakes. 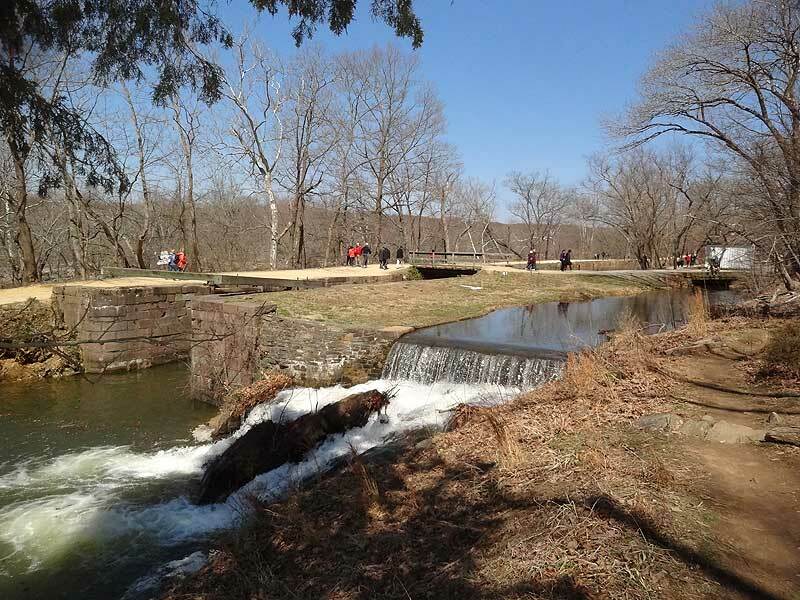 Continue on the trail passing the Marsden Tract Campground, then arrive back at the C&O Canal. 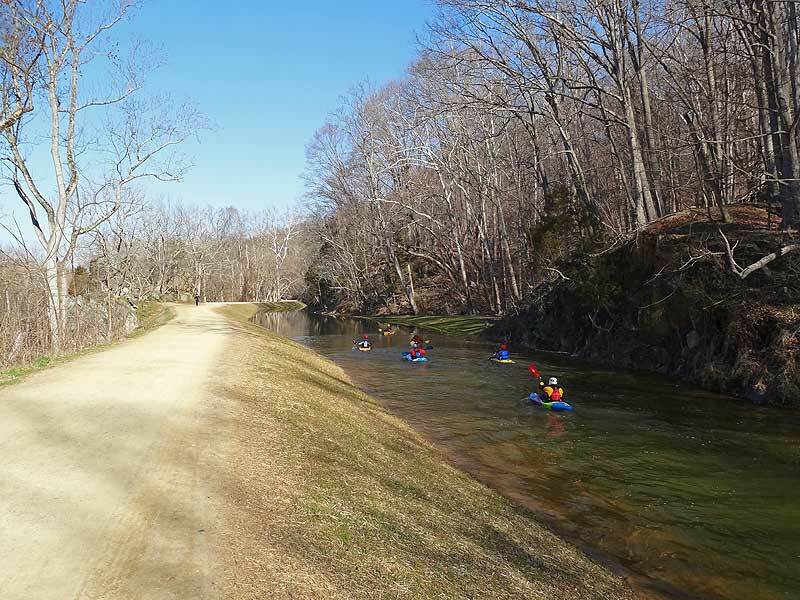 Mile 4.4 - Now turn left on the C&O Canal heading back towards Great Falls. 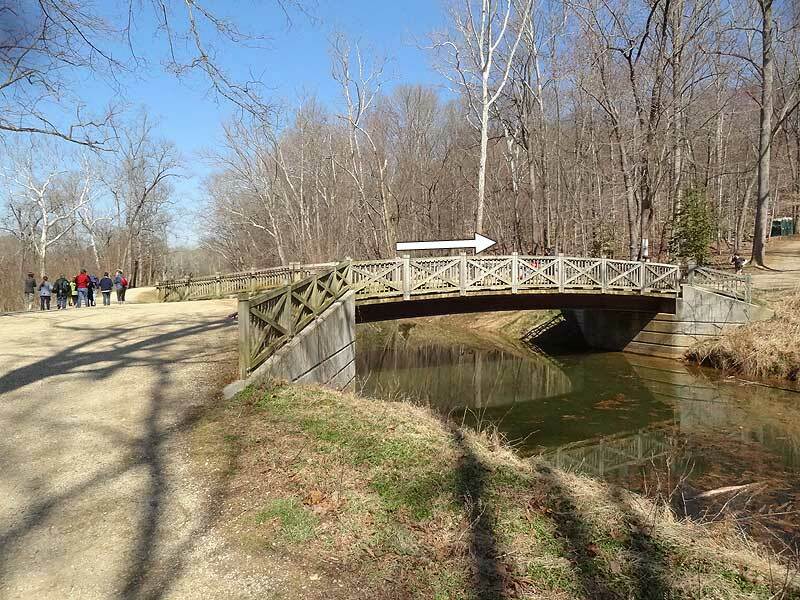 In 1.1 miles reach the Anglers Parking Area bridge over the C&O Canal. 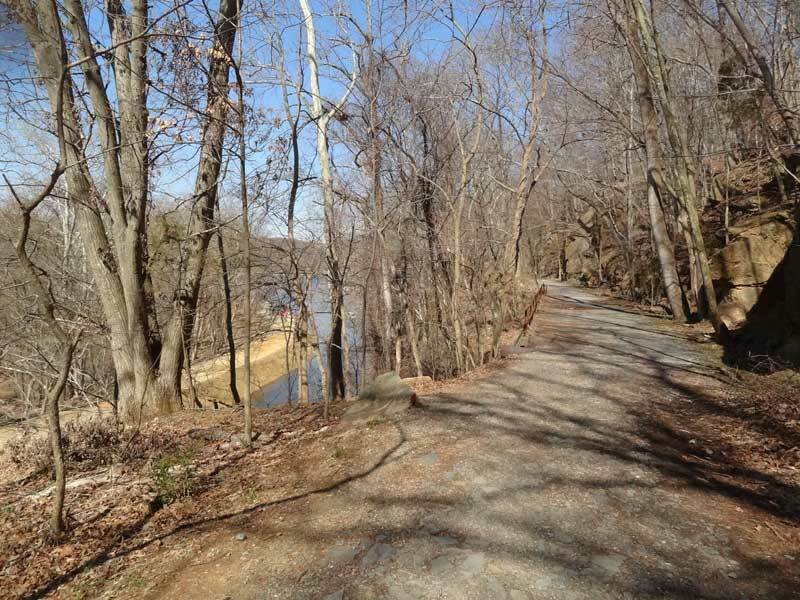 Mile 5.5 - Cross the Anglers parking area bridge and ascend the wooden steps to the Berma Rd Trail. 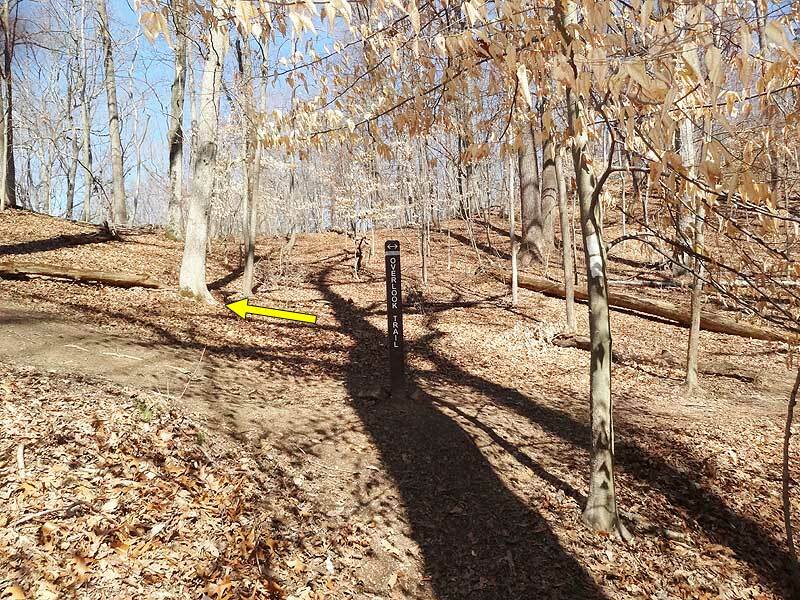 Turn left on the Berma Rd Trail for 1.4 miles to the intersection of the white blazed Overlook Spur Trail. 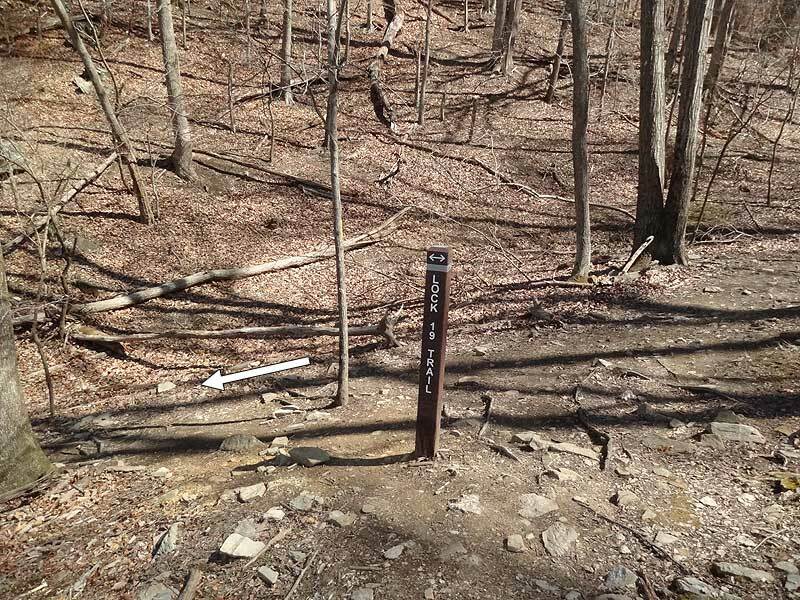 Mile 6.9 - Turn right uphill on the Overlook Spur Trail for 120 yards to the intersection of the yellow blazed Overlook Trail. Turn Left on the Overlook Trail. 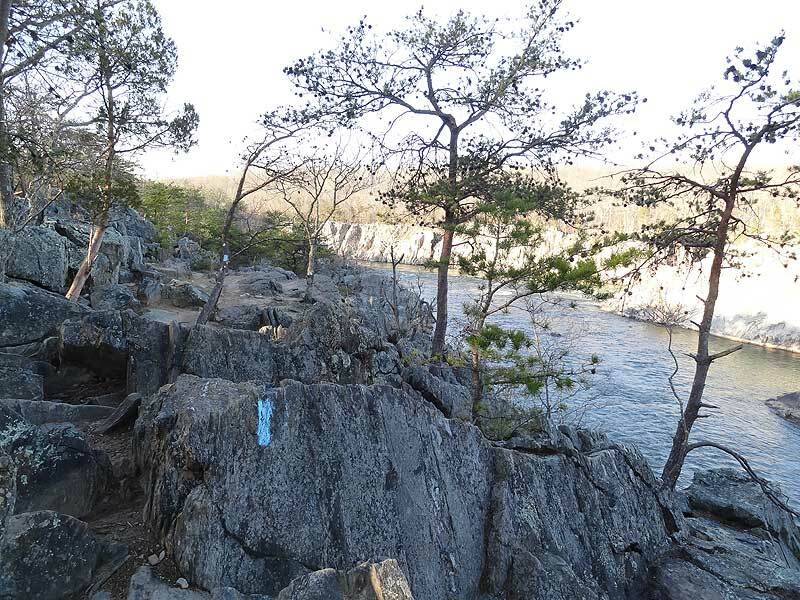 You will pass a unmarked side trail to an overlook of Great Falls, then continue to the main overlook at a switchback on the trail. Continue now downhill to the Lock 19 Trail intersection. 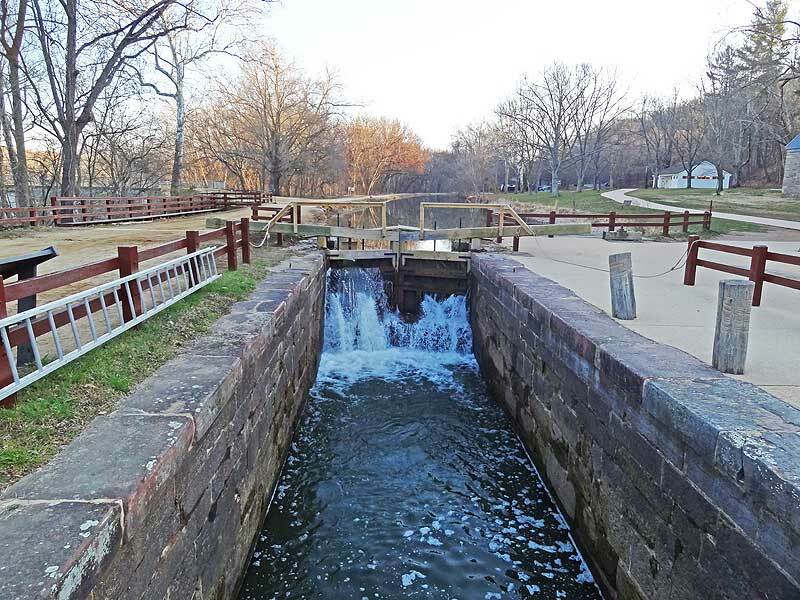 Mile 7.5 - Turn left at the Lock 19 Trail and follow it back down to the main Great Falls Park area. 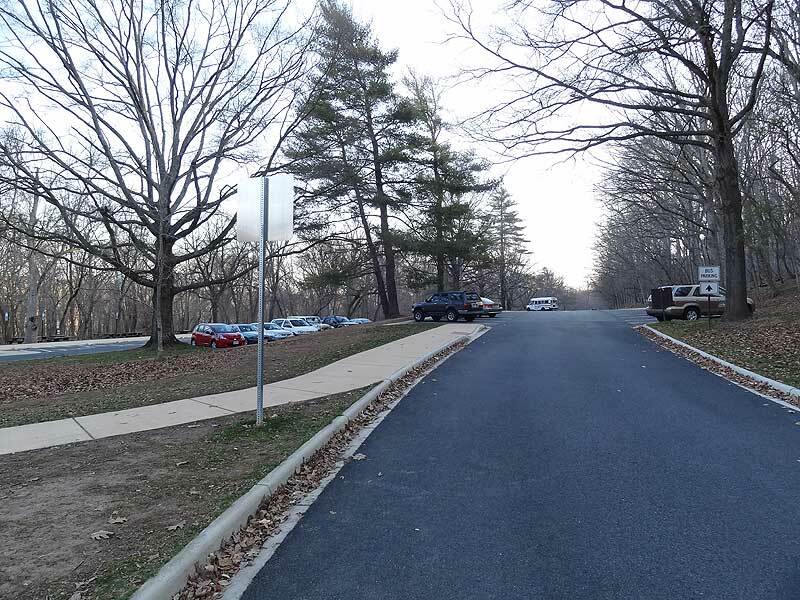 Continue past the Great Falls Tavern and Visitors Center back to the parking area. Mile 7.8 - Arrive back at the parking area. 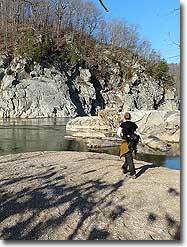 If you enjoy long walks/hikes in nature, and hate driving/don't have time for Shenandoah, then Billy Goat Trail is perfect for you. I've been here 4 times in 7 months. So far, every season has presented a different look of this trail, and I've loved it every time. 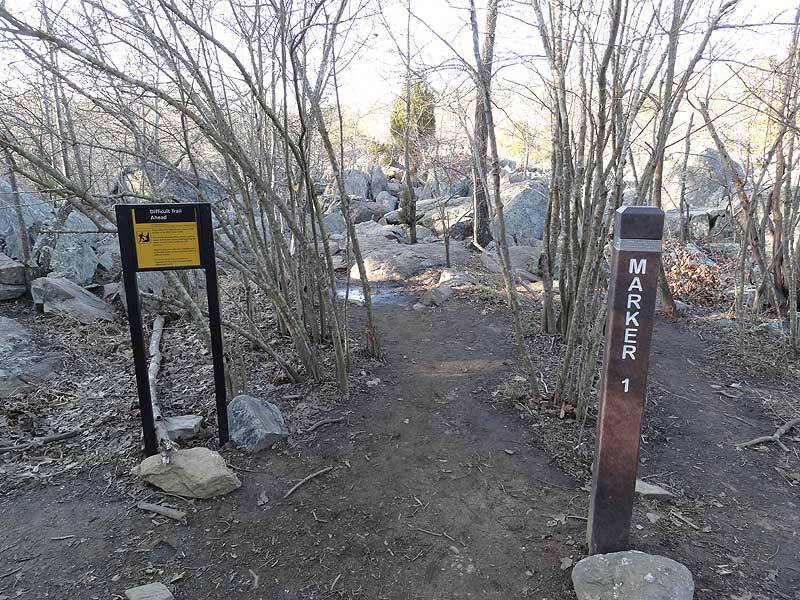 Whether you're watching geese in the river, dogs strolling along, kids scampering all over, or are just one of the several people navigating the 50 ft cliff, this place gives ample opportunities to connect with nature despite the crowds. My favorite thing about it is that it is short enough to squeeze it into a workday, strenuous enough to break a sweat, countless spots to take a break, and beautiful views to keep you going! Flat out... my favorite hike. With over 1700 legs of the "A" Trail in 16 years, I may know Bear Island better than the deer or foxes. 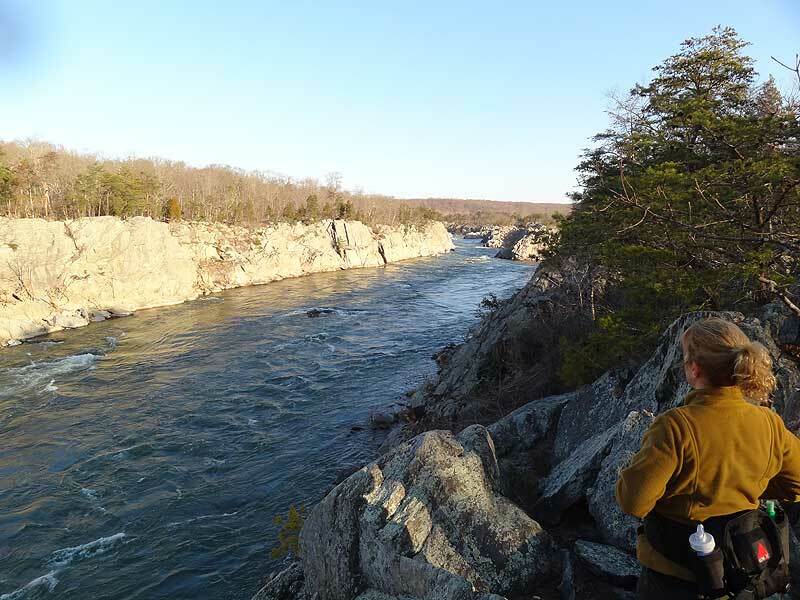 There is NO better hike within 70 miles of Washington, DC in any direction. This is where you come to sweat, get scraped up and commune with nature. 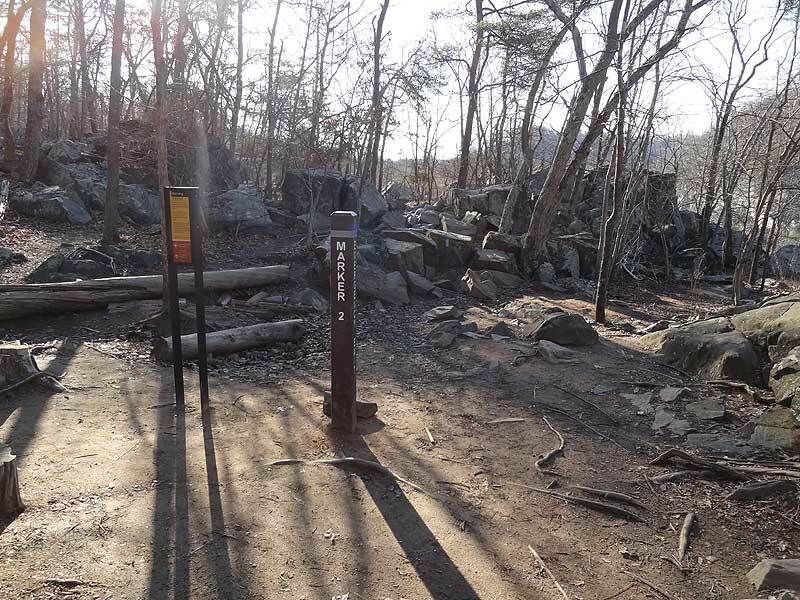 Here I would like to ask that all the potential hikers who check in here, please observe a certain amount of courtesy for the trail and other hikers. Also, RESPECT the trail. It is DANGEROUS! Over a dozen lives a year are lost out here by those who are either ill equipped, out of condition or inattentive to the terrain. Please use adequate footware. 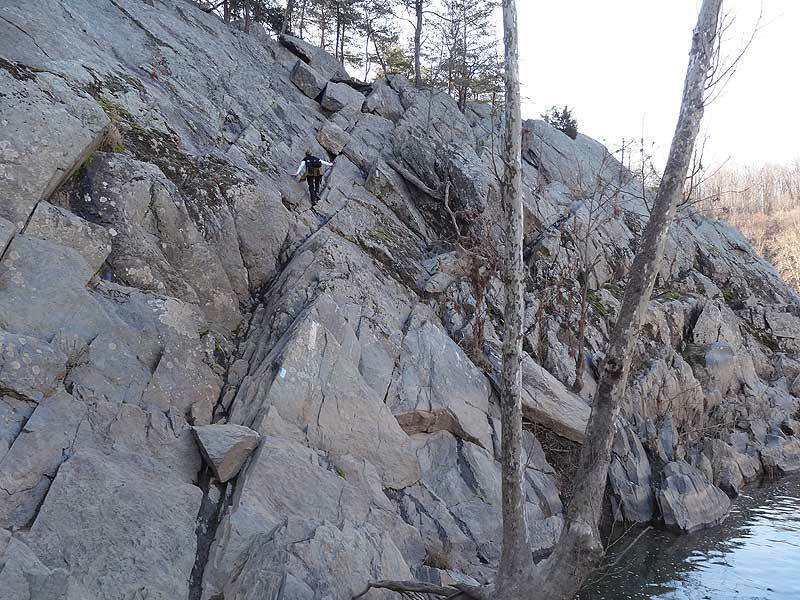 Cabin John VFD River Rescue respond to over 100 calls per year for orthopedic injuries or exhaustion. I've seen them have 3 separate calls in one day during the spring and summer on weekends. This is NOT the place to bring mom for beautiful stroll into nature. Take her to a restaurant. Now for those who wish to hike the trail. Please don't show up with more than 4 or 5 to your party. Much of the trail is single passage. Traffic runs both ways. Be considerate to the other hikers who arrive in 1s and 2s. Also parties of 4 or more typically travel much slower and make a lot of noise. There are foxes out here that may be visible to the quiet. Hognose snakes can be heard to "hiss" when near if you are quiet. Snappers can hear people 40 yards away and just disappear until the quiet returns. You also want to hear the Piliated Woodpecker which sounds like "Jungle Monkeys" out here. Please stay out of the water, as it is a CFR VIOLATION and fine. It's also a major cause for the loss of life out here. And no one wants to see this place closed off to the public. I would also recommend that headphones/ear buds be put away. Stay off of phones unless stopped. You need all of your senses in gear as there are not two flat areas next to each other out here. Its too easy to roll an ankle out here when talking, looking behind or just not paying attention to exactly where one is stepping. One small piece of advice, upon approach to Purple Horse Beach, note that the rocks here are more weathered and rounded. They are the slippery even when dry. Also note these same rocks are darker than anywhere else around here. They have been in the sun all day and radiate heat. It is a giant sauna bath. Many approach heat exhaustion in this area. This is "Ground Zero" for Cabin John River Rescue on emergency calls. It is also typically the place where bodies will wash up of those who were stupid enough to jump off the cliffs. Please, enjoy the BGT "A". Respect it and the other hikers who have come to love this small area of paradise. All of Bear Island is one big rock, so please be careful as any slip has the potential to be critical. Getting off my soap box now. I love this place. Hope to see you out here. 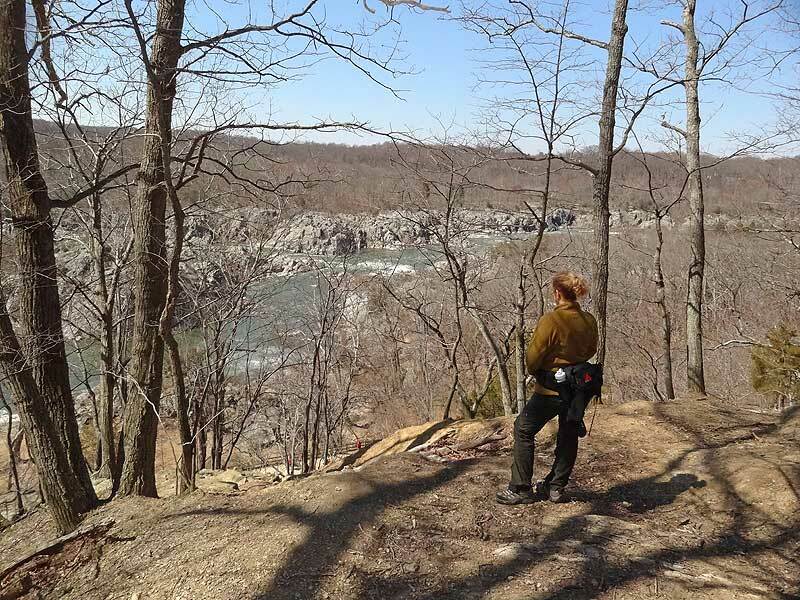 First time doing the Billy Goat A trail from beginning to end. The 50 foot wall is a challenge but doable. 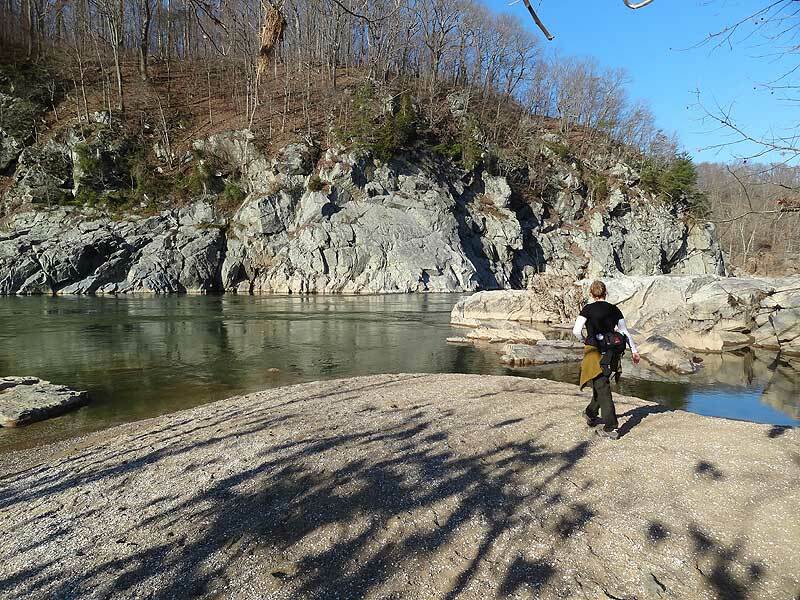 If you like rock hopping you will love this hike. Stunning views! I went on a Saturday afternoon and while there were many people on my he trail I was hadn't call for t crowded. Very little waiting time. Next time I'll wear my gloves. This was an amazing hike! You get a great workout in and the views are spectacular. I arrived at the parking lot at 8 am and the lot across from the Old Anglers Inn was full, I got lucky that someone was leaving as I was pulling in, so definitely get there early. When I started the trail there was already 3 groups ahead of me and about 5 groups behind me. I expected that due to hiking on the weekend, but if you want a quiet trail you have to get there earlier. The trail itself was tons of fun, I am in shape, but in no means a hiker so I was nervous doing this trail but it wasnt bad! Plus, there were other people who were also doing the trail that helped other hikers out. There were already people sitting on the overlooks when I got there but I was still able to find some spots to sit. Overall this was an awesome hike, arrive early and have fun! Re Section A: Wonderful trail, but follow these simple rules for maximum enjoyment for yourself and others. Arrive early, especially on nice weekends. The trail gets very crowded and by 10 am, there can be long waits at certain spots on the trail. Leave your pet at home. 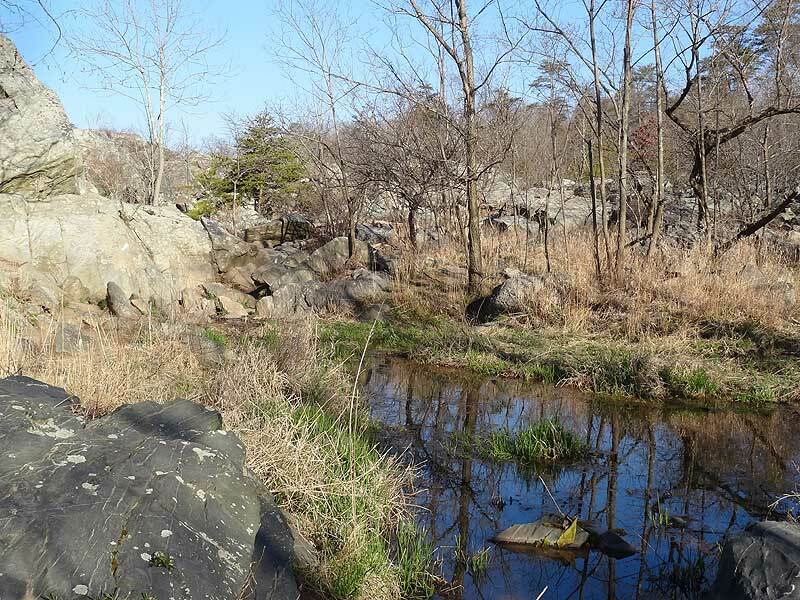 Pets are not allowed on Section A of the Billy Goat Trail. Stay on trail by following the blue blazes. BGT-A is on Bear Island, full of rare and endangered plant species. You'll also avoid the ticks, chiggers, copperheads, and northern water snakes. Do not enter the river. 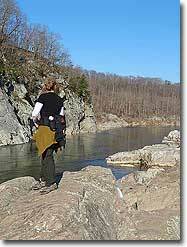 The Potomac is very dangerous and entering the water is illegal. Even wading can be deadly. Bring plenty of water and wear appropriate clothing. Injuries are frequent, rescue is difficult, and caution is appropriate.